Veteran Owned Locksmith, LLC is a full service locksmith that provides a variety of services for commercial businesses. For the office, Veteran Owned Locksmith provides service for filing cabinets whether it is lock outs or changing the cylinder lock system. Veteran Owned Locksmith will also repair commercial grade locks and change out commercial grade locks to suit the needs of the business. You will find a variety of hardware with Veteran Owned Locksmith to suit your needs from color, style, grade of lock security, and quality of service. We can also replace the lock systems on paper towel and toilet paper dispensers. Your office needs to be in constant operation and Veteran Owned Locksmith, LLC will help you keep your office running efficianetly. Veteran Owned Locksmith, LLC is a progressive company that is constantly looking for new and improved ways to deliver products and services to our customers efficiently and fast. Veteran Owned Locksmith, LLC is your number one provider of Master Key Systems and Grandfather Master Key Systems. We do not sit at the table and run the numbers which can be very time consuming. Veteran Owned Locksmith, LLC uses the latest software to quickly create your Master Key System. What does that mean for you? Faster service, quality of products, and less time in getting your Master Key System up and running. 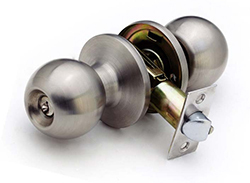 You may think that commercial locks do not come with a style that suit your needs. Veteran Owned Locksmith, LLC has a selection of products for everyone's taste. You can find locks with Veteran Owned Locksmith, LLC that are standard, decorative, and come in a variety of colors such as Aged Bronze, Satin Nickel, Chrome, and more. Believe it or not, your locks add to the decor of your office or building and can add that perfect little touch to make your curb appeal and building appearance amazing. In today's market, customers can be very particular about a businesses appearance and your locks are a part of that appearance. Did you ever think that a customer would compliment you on your locks? Veteran Owned Locksmith, LLC will come to your office or building and provide a free assessment of your property. You can choose what style and color you want and we will always work within your budget. Call Veteran Owned Locksmith Today For Your Free Quote! LOCALLY OWNED AND OPERATED BY MILITARY VETERANS. Copyright © 2014-2016. Veteran Owned Locksmith, LLC. All rights reserved.